Last year, after seeing tons of Dr. Who costumes that we didn’t get, Jon and I decided to watch Dr. Who. The new seasons, of course. And it was GREAT guys, Dr. Who was super fun, are you my mummy, etc. Except, for the first few seasons I was hugely distracted by Rose Tyler‘s bad makeup and dye job–so either that was part of her character, or the makeup department was super low-budget at the time. ANYWAYS. We’re not here to talk about makeup, we’re here to talk about shows that Dragon*Con has inspired us to watch. My obvious one is Dr. Who, of course, and I’ve just started Torchwood. 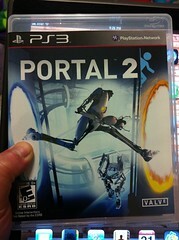 Also, Dragon*Con inspired me to play Portal and Portal 2, which is hilarious, because I never really played videogames. As you all know, I LOVE PORTAL. (I really love Portal). I still really haven’t played any videogames besides Portal, y’all. Portal is great. What about y’all? What new fandoms has Dragon*Con made you pursue? Or not pursue, maybe because of obnoxious fans? Either way, has Dragon*Con opened your horizons? Let me know in the comments!